After arriving to Santiago you will be transferred to your hotel. In the afternoon we will start our trip leaving the hotel behind and visiting La Moneda, the Government Palace, where we will learn about the historical and current importance of this place. Following this, we will enjoy a walk through the pedestrian streets of Huérfanos and Ahumada, where the main commercial activity of the city is concentrated. Afterwards, we will visit the main square of the city called Plaza de Armas, which is surrounded by the Metropolitan Cathedral and other beautiful buildings. Today we will also visit the Santa Lucía Hill,the mount upon which the Spanish founded Santiago in 1541. It is a lone steep rock, with many plants and an antique building rising steeply from the city below. Later, we will cross the Mapocho River to get to Bellavista, the cultural and artistic neighborhood of Santiago. Bellavista lies at the foot of the San Cristóbal Hill, the highest in town, in the middle of the Metropolitan Park. Here we will have the chance to climb this hill up in one of the typical cable cars to explore the surroundings. Finally, we will visit Providencia with its top restaurants, elegant shops and modern high-rise buildings. After this amazing tour we will call it a day and return to the hotel. Breakfast. Today we will visit the wonderful city of Valparaiso (declared a World Heritage Site by UNESCO) where we will fall in love with its natural beauty and Chilean charm. There, we will take a ride on one of the town’s typical cable cars that will lead to a magnificent lookout point. Afterwards we will stroll along the Atkinson and Gervasoni boardwalks; full of history from when this important port city was considered “The Jewel of the Pacific” (before the opening of the Panama Canal). From there we will head to Plaza Sotomayor a significant landmark honoring the heroes of Iquique and the Pacific War. Last but not least we will visit the La Sebastiana Museum (*Closed on Mondays), a place of inspiration for the Chilean poet Pablo Neruda (Nobel Prize winner for Literature, 1971). After a full morning we will then make our way to Viña del Mar (the garden city), a well-known Chilean seaside town with fascinating natural beauty, cuisine and lifestyle. We will walk the waterfront and visit the city’s major attractions including the parks, statues and gardens. ​This excursion will take us to the Casablanca Valley. Today we will go through an important agricultural valley, Curacaví, which is known for its fruits and for its broad variety of restaurants offering typical Chilean food. Located approximately 80 kilometers away from Santiago, during the past decade the Casablanca Valley rapidly became Chile’s most important grape-growing valley for the production of premium white wine. As part of this excursion, you will enjoy a tour and tasting at one of the many boutique wineries that are part of this flourishing wine route. We will visit two vineyards: Casa del Bosque and Matetic. Notes: Private service with English speaking guide, wine tasting. *Depending on the schedule of this service, additional costs may apply. Breakfast, they you will be transferred to the airport to fly to Calama. After arriving at the airport you will be transported to the town of San Pedro de Atacama. This colorful village is located 2.440 m / 8.000 ft. above sea level in the middle of a green oasis. Later that day, in the afternoon you will adventure out to the mystifying Death & Moon valleys boasting incredible stone and sand formations. There at sunset you will have the opportunity to view the beautiful fading light over the vast landscapes. After breakfast, a transfer will take you to the airport to board your departure flight. 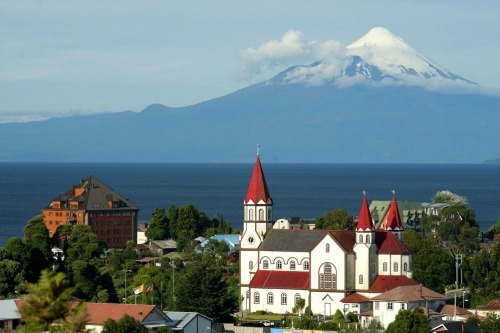 Upon arrival at Puerto Montt Airport you will be taken to Puerto Varas, known as the „City of Roses“, located on the shores of Lake Llanquihue - Chile‘s largest lake. Here you can stroll along the shore and enjoy a wonderful panoramic view of the volcanoes Osorno and Calbuco and the lively beach in the summer months. Overnight in Puerto Varas. After breakfast, you will depart to Puerto Montt for a brief city tour including the lively fish market of Angelmó, before you are taken to the airport of Puerto Montt. After arrival to Punta Arenas we will be picked up and whisked away to explore the cultural and natural wonders of this southern city. We will learn about its history and follow the footprints of brave polar explorers. We will also visit a variety of monuments and points of interest including the main square, the navy and maritime museum, the famous Roca Street, the Nao Victoria Museum, the Patagonian Institute and of course the city’s coastline. After our city tour we will then be transferred to Puerto Natales where we will spend the night. Not included: International and national flights. After our arrival at the Santiago airport we will be transferred to our hotel. In the afternoon we will go on a tour around the Chilean metropolis; recognized worldwide as a must-see city. excursion to Viña del Mar and Valparaiso. Atacama. City walking tour and In the afternoon we will visit the beautiful Moon Valley to observe our beautiful surroundings of snow-capped volcanoes and breath-taking rock formations. Hosteria San Pedro 3* or Casa Atacama 4* for 3 nights. Miscanti & Meniques and Toconao, a village made of white volcanic stones. Lunch included. The day is at leisure for own activities. Optional: Excursion to the El Tatio Geysers. Transfer to Calama airport and flight to Santiago. Half day Undurraga wine tour. This is a classic guided tour. It lasts approximately one hour and 15 minutes and includes a complete visit of the park, including the Aliwen corner, vineyards, soil analysis test pit, vinification plant, entertainment garden, and underground cellars, ending with a great tasting of 3 reserva wines(brands depending on availability), and a gift wine glass. After breakfast we will depart for Torres del Paine National Park. On the way we will visit the well-known Milodon Cave, famous for the giant sloth that once lived there. Once at the park, we will explore the Amarga Lagoon and the Pehoé Lake while enjoying outstanding views of the Paine Massif and the famous mountain peaks. From there we will travel a bit further to reach Grey Lake where we will have amazing lookout points and observe the nearby glacier. settlement on the Straits of Magellan. End of the trip and transfer to airport for departure flight or post-tour. All rates and dates are subject to reconfirmation!